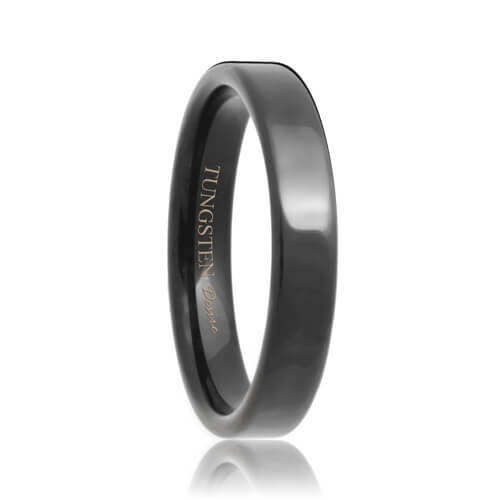 The Savannah tungsten carbide wedding band features a jet black surface. These black tungsten wedding bands are a narrower and slimmer version of the traditional pipe cut version. They feature dark and sleek lines and a highly polished surface guaranteed to turn heads. The black coating is bonded to the tungsten ring giving the band a unique and stylish look. Most sizes ship within 1 business day. Free Lifetime Warranty and Lifetime Sizing; pay no restocking fees or deductibles! I spent a long time researching tungsten rings before I decided to replace my original wedding band. Times were tight when my husband and I married 15 years ago. My new tungsten wedding bands are simply perfect. The dark polish even shines in the shade. We were a little nervous about buying rings on the internet, sight unseen, then shipping it to our house. Tungsten Rings and Co. rose above all other jewelry stores we visited. They followed through every promise and they delivered super fast. This was one purchase that meant a lot to us.